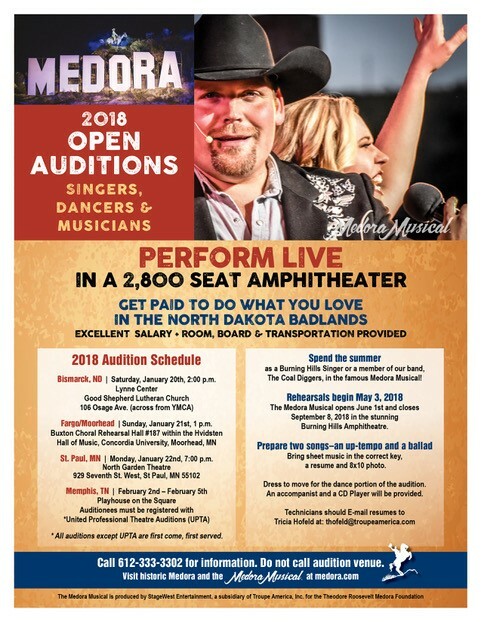 (Medora, ND) – The Theodore Roosevelt Medora Foundation, in conjunction with StageWest Entertainment, is pleased to announce auditions for the 2018 Season of the Medora Musical are set to begin this weekend. Performers interested in trying out for the Burning Hills Singers and Coal Diggers Band are welcome and encouraged to attend one of the auditions hosted at the dates and times below. Members of the media are welcome at audition venues. Representatives from StageWest Entertainment — several of whom have also been cast members themselves — and auditionees, will be available for questions and comments. 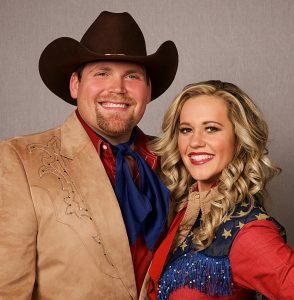 The professional cast of each season’s Medora Musical hails from all across the nation – with talented members of the cast often coming from the Show’s home state of North Dakota. Each year over 1,000 performers audition for the show and each year’s cast is different than the previous. Over the course of it’s 53 year history, the Medora Musical’s professional cast has been made up of a mixture of performers and musicians who have traveled the world performing on cruise lines, who’ve starred in Broadway productions, appeared on hit TV shows like TheVoice and even those who’ve launched their career in Medora and went on to enjoy an extremely successful career in entertainment. Singers, dancers and musicians are required to prepare an up tempo and a ballad for the audition. Prospective performers should also bring sheet music in the correct key, a resume, and an 8×10 photo.